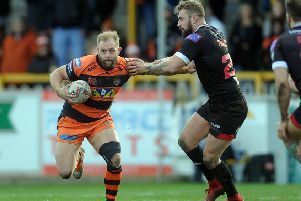 Castleford Tigers are set to start the Super Eights competition with revenge on their minds after being handed a home game with Hull FC in their first game. The match, to take place at the Mend-A-Hose Jungle on Friday, August 7, will see the Tigers looking to make some amends for two defeats away to Hull FC this year when they were knocked out of the Challenge Cup in May and lost a vital Super League match earlier this month. Cas did beat Hull 20-14 in their home match in the league in March and will be looking for a repeat success to get their Super Eights campaign off to a flyer as they look to climb into the top four. The Tigers will also be at home in their second game when Warrington Wolves are the visitors on Thursday, August 13, but they then face four away games and just one further home match before the campaign ends. A tough finish is in prospect with Cas down to face the current top three in their final three matches.